Continued from last week! Here's a little look into my bullet journal (basically my administrative assistant) thanks to the #planwithmechallenge on Instagram. I skipped a couple more days (12: Financial Plans - that's all online in my accounting program, 13: Major Life Events - again, online, as that's what my personal blog is for, 14: Multiple Schedules - I don't keep his, I can barely keep ahead of my own, hahah!) and you'd think skipping a couple would put me AHEAD and not BEHIND, hahahah. Yes; you would think that, wouldn't you. Where was I? Future planning! I have a 12-box spread at the beginning of the year, into which I put the major things I want to accomplish during the months of the year. Then I have a page, not shown, that breaks those things down into tasks to be done to acheive those things. Those tasks can run anywhere from a couple of weeks to a couple of months, depending on the size of the project. 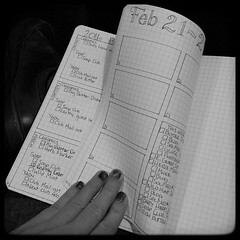 Then I transfer from that page, to my weekly spread, usually about a month in advance. 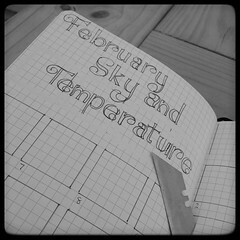 I do those when I set up my next month's pages, which I usually try to do at the beginning of the month before... so, the first week of February, I'll do March's pages, into which I'll add the weekly tasks from my "Big Ideas" breakdown. This is terrible - the more I skip days that I don't have anything to share (like Day 17, Hacks, or Day 14, Multiple Schedules) the more I fall behind! How does that even work?! ANYWAY. Mostly analog, some digital. For digital, I have things stored in Evernote, like my yarn dye recipies, that I learned early on keeping in an analog state was a recipie for disaster because I would wind up spilling dye water all over them. So I keep that in Evernote, check it on my phone as I'm going, and keep my phone in my back pocket where it won't get soaked. I also use Google Keep on my phone for things like supply ordering lists when I'm working on things in the studio and notice I'm low on something but don't necessarily want to go to my office to get my bullet journal. Then when I'm ready to place my orders, I can access Google Keep from the computer and check things off that way. My husband and I also have a grocery list app we both use, that syncs to each other's phones -- very handy! Other than that, I'm an old-fashioned Analog girl. 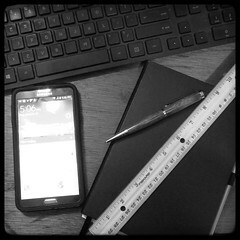 There's something about writing stuff down that means more to me than storing it electronically. Little mistake? Like a word wrong, or written in the wrong place? Cross it out. Unless it's pretty big and/or I don't have space to write what it's supposed to be; then I use white-out tape. Really bork up a whole page, though? Cut the whole thing out! Although I'm liking other people's suggestion of printing something out and taping it over the page, like a coloring page or inspirational quote or something. I might have to incorporate that...! I review daily, weekly, and monthly. I'm always reviewing! Mostly because I have a memory like a steel sieve, so I review in order to catch anything I might have forgotten or missed. Daily, I review what's going on that week, and look at last week in case there's something unfinished I forgot to carry over. Weekly, I review all the weeks previously (for about the last two months or so) to see if there's something unfinished or that I need to revisit. 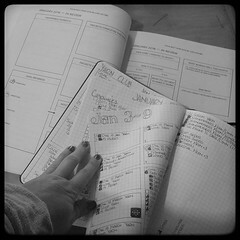 I also review my "Big Ideas" page for the month, crossing out completed tasks. Monthly, I fill in the prompts in Lisa Jacobs' Your Best Year productivity workbook and planner, during which time I review the prompts from the beginning of the month as well. Like I said, I'm always reviewing! I do keep a lot of lists. 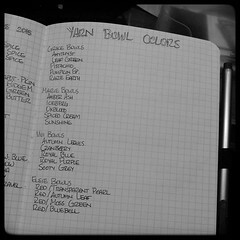 Lists of upcoming yarn club ideas and notes on colorways (which I won't photograph, because "spoilers, sweetie.")... lists of people who've signed up for a recurring soap shipment and what they'll be getting during the year (again, no photo, no spoilers)... and lists like the one shown, of glaze colors I used on specific pieces. I also keep this in Evernote, but there's something about seeing everything written down, something that I can put next to me on the table when I'm glazing, along with color samples, that keeps me from accidentally doing a bunch of things in the same color (and keeps me doing things in the colors I originally intended). I will generally add these wherever in my bullet journal - the next available blank page. Of course I then add that to my Table of Contents! I believe I've already mentioned, too, that I keep a grocery list on my phone ("Our Groceries") that syncs with my husband's phone. Either one of us can add something to the list and it shows up pretty much automatically on the other one's phone. This is great and really cuts down on "can you get me... can you get me... why did you forget to get me...". I also keep a running supply list on Google Keep, for my art and office supplies for work - I can also access this on the desktop so that when I'm ready to place orders the info of what I've been tracking in my studio is right there. Come back next week for the last of the January challenge!